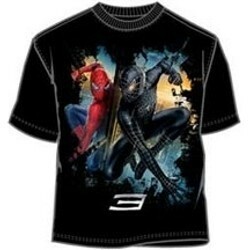 Black Spiderman 3 Movie T-Shirt - This is an officially licensed superhero tee shirt from the Spiderman 3 movie poster that features the classic and black Amazing Spiderman. Tee shirt color is as shown and this tees make a great gift for any Spiderman fan. Our Black Spiderman Movie shirt is incredibly comfortable and these tees are made to last. If you have questions regarding our Black Spiderman Movie t-shirt, please email us with the product name and number.